MTherapy Facial Rejuvenation Beauty Pod review – radiant skin in only 2 minutes! The driving force behind the development of the MTherapy treatment is the idea that the more invasive a treatment is, the less likely we are to continue to use it regularly. This resulted in the formulation of a truly unique home beauty treatment that is probably one of my most pleasant to use we’ve ever encountered. With regular treatments, MTherapy treatments will produce true rejuvenation in five major areas: hydration, fine line reduction, skin radiance, tightness and tone. Insert the special MTherapy podlet into the pod and go! Each pod releases a controlled vapour within a two minute treatment, containing a patented combination of 20 nutrients including minerals, herbs, vitamins and hyaluronic acid. When infused within the gentle vapour, these penetrate the skin easily to make your face look and feel fresher and younger without using any parabens. ◦ Perhaps the most non-invasive at home anti-ageing beauty treatment out there. ◦ Relaxing, efficient, and natural with no parabens. ◦ Only 2 minutes of use once or twice a week – but can be used as often as you like so there’s nothing to stop you from getting the extra boost of confidence from a treatment before a night out. ◦ 100% of participants in clinical trials saw an improvement in wrinkle depth. See how it works below… reviews after the jump! “I am a sucker for the latest gadgets and miracle products and have the beauty bag to prove it. However, quite often I don’t get the amazing results promised or it doesn’t live up to the hype. When I came across the Mtherapy pod, it sounded too good to be true. MTherapy beauty Pod is an innovative anti aging treatment that is non invasive – using a warm vapour of patented minerals, herbs, vitamins and hyaluronic acid mixture that is infused into your skin. The most fantastic part is that it takes just under 2 minutes. Could this really work ? Clinically proven results in just under 2 minutes a couple of times a week? Well, YES it works !!!!! The pod is a small very futuristic looking device but took just 10 seconds to set up. 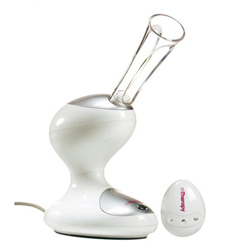 Simply push on the vapour spout, pop in the special podlet containing the vapour mix and switch on. The vapours are released in two stages, the first to open pores and cleanse, then the second to infuse your skin with the potent mix of ingredients. It was a really pleasant feeling when the vapours were working on my skin and immediately afterwards my skin looked plump, fresh and smooth. The effects lasted a few days and I was eager for my next session. I suffer with dry patches and occasional breakouts, After 3 sessions my dryness had gone and my skin looked healthy and perky. I was starting to get comments on how nice my skin was. My few spots disappeared and haven’t returned since. At 32, I fortunately don’t have a lots of lines yet but I do have a stubborn frown line between my eyebrows. I can honestly say this has almost disappeared after just 5 weeks use, and my very fine lines on the outer eye look far plumper and less obvious. I feel like my skin has taken on a new lease of life and I have even felt confident to go makeup free on several occasions now. “ For me the MTherapy is a great device for when you wake up with a dull and devitalised complexion, and have little to no time to do all your usual skin care tricks. It’s super easy to use, and the steam delivered is gentle on the skin and does not cause any skin reddening. Which Foreo Luna should I get? CurrentBody’s Ultimate Guide. Hello, my wife has bought an mtherapy system, and she needs a supply of pods. Yours are at a good price, but when I click to see them, it cannot find the Web page. Do you have any in stock or not? I have tried to track some of these down for you but have not been successful, as we no longer have them in stock.